It can be frustrating for many brides to constantly deal with tiny sample sizes. Not being able to feel how potential wedding dresses hang and fit can make ordering an absolute nightmare. Leaving all of your details up to your imagination and relying on alterations is not ideal. Thankfully, New York Bride and Groom stocks a variety of larger sizes so everyone can channel their inner princess, regardless of their size. “Anything with ruching can be very forgiving, regardless of your shape or height,” advises Hall. “It also helps to add support and gives the dress more structure.” In particular, look for dresses that are ruched in an asymmetrical pattern — for instance gathered on one side of the dress. “That pattern brings the eyes up to the face and creates a vertical shape to the gown,” says Hall. Colors Available: White/Silver, Ivory/Silver. Sizes Available: 16W-32W. Every bride deserves to feel fabulous and sensational. Show off your favorite assets and discreetly camouflage any areas of concern by enlisting the help of an experienced bridal consultant at New York Bride and Groom Raleigh. There is no need to feel self-conscious or uncomfortable. We stock the latest wedding dress designs and accessories in a variety of sizes to simplify your special shopping extravaganza! The following things to keep in mind for plus sized shopping can come in handy for you and your bridesmaids. Before you settle on a style or designer, make sure they accommodate all the sizes your party needs. 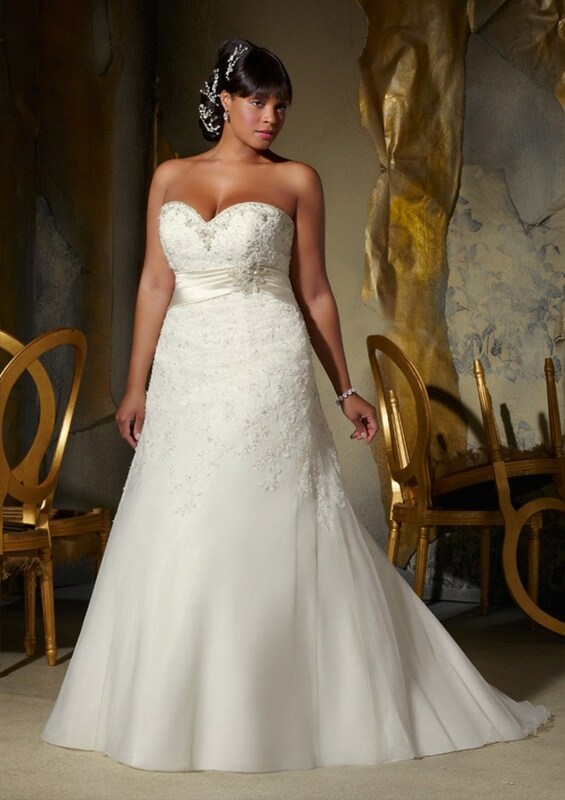 Many popular bridal outfitters offer up to size 16, with maybe a handful of styles available in 18 and 20. But true plus size doesn’t even start until size 16. The last thing you want is for the other bridesmaids to purchase non-refundable dresses, only to have one friend stuck without even a workable option. Every woman has areas she’d like to deemphasize. A-line shapes are forgiving to the thighs while showing off the waist. Or, Chan suggests, lace illusion sleeves, which is a stylish way to flatter upper arms. And in general, she says, soft draping or ruching over the belly, bust, or backside also enhance figures.